We haven't seen their faces. We don't know their names. We only know a number: 711. That's how many immigrant kids from separated families remain in custody, according to the latest government tally. Officials say that, for various reasons, their families weren't eligible for reunification by Thursday's deadline. They might be in the future, although a former head of Immigration and Customs Enforcement warned this week that some of the children might never see their parents again. What happens to these kids could vary greatly depending on each individual case. Attorneys are still battling over the next steps in court. And as the landscape shifts, lawyers for immigration advocacy groups are trying to figure things out as they go. "It's just layers and layers of legal complexities that have been created," said Wendy Young, president of Kids in Need of Defense, a nonprofit dedicated to providing legal representation for unaccompanied minors. One point of confusion: Although these children crossed the border with their parents, they're now considered "unaccompanied alien children" in the government's eyes -- the same as if they'd come to the United States alone. "There are some really thorny legal questions that arise," Young said, since these children became so-called unaccompanied minors only after officials separated them from their parents. In the short term, these kids are in the custody of the US Department of Health and Human Services' Office of Refugee Resettlement (ORR), which has been charged with the care and placement of unaccompanied alien children since 2003. The division operates more than 100 shelters across the country that house thousands of children until they can be released to sponsors while their immigration cases continue. Many of the shelters are run by contractors, such as the massive facility inside a former Walmart in Texas that reporters toured last month. The average length of stay in ORR custody is 57 days, officials said in June. But there's no limit on how long a kid can be held at an ORR facility, Young said. About 90% of unaccompanied kids in ORR custody are released to sponsors, Young said. Sponsors usually end up being family members, she said, and more than half the time they've been parents. It's hard to know what the breakdown will be for the 711 kids who remain in custody. But officials have said some children from separated families were already released to sponsors. What happens if a sponsor can't be found to care for a child? "The normal rule is that with these unaccompanied kids, if they don't have a relative that they can be released to, if they didn't arrive with a parent, then they are placed into federal foster care," Young said. Could they then end up being adopted? Historically, that's been very rare, according to Young. "I've been working on this issue for 30 years. I can only think of maybe half a dozen cases where one of the unaccompanied kids has actually been put up for adoption," she said. "That's usually done when there's evidence that the parents are dead, and there's no other family member who can attain guardianship." Even once they're released to sponsors, unaccompanied minors don't have legal immigration status. They're in removal proceedings, and if they don't succeed in making their cases to stay in the United States, they could be deported. The same thing could happen to the kids from separated families who remain in custody. Children from this group currently have immigration cases separate from their parents. They'll have to make their immigration case alone, and there's no guarantee they'll have a lawyer to help. If a child can't prove his or her case in court, the case could end with a deportation order. Officials say some of the 711 children still in custody weren't reunited because the parents declined reunification. More than 400 haven't been reunited because their parents were likely deported and officials don't know the parents' whereabouts. In other cases, families weren't reunited because red flags such as criminal convictions came up in the parents' backgrounds. The government maintains it acted properly to protect children's safety and follow a judge's order. The ACLU and other immigrant advocacy groups are pushing for the government to provide more details about each case. They argue that parents may have been coerced into signing paperwork they didn't understand -- an accusation the government flatly denies. Advocates say they're particularly concerned about parents who weren't allowed to reunite with their children due to purported criminal records. "The government should be held accountable for the mess it's made and offer detailed rationales for why they deemed this parent inappropriate to release to," Young said. "I do not trust this government to make that decision correctly." Once more is known about individual cases, it's likely that advocates will keep pushing for as many children as possible to be reunited with their parents -- whether they are still in US custody or have been released or deported. • Kids whose parents were already deported could end up signing voluntary departure orders to rejoin their families, if their parents are located and tell officials they want to be reunified. 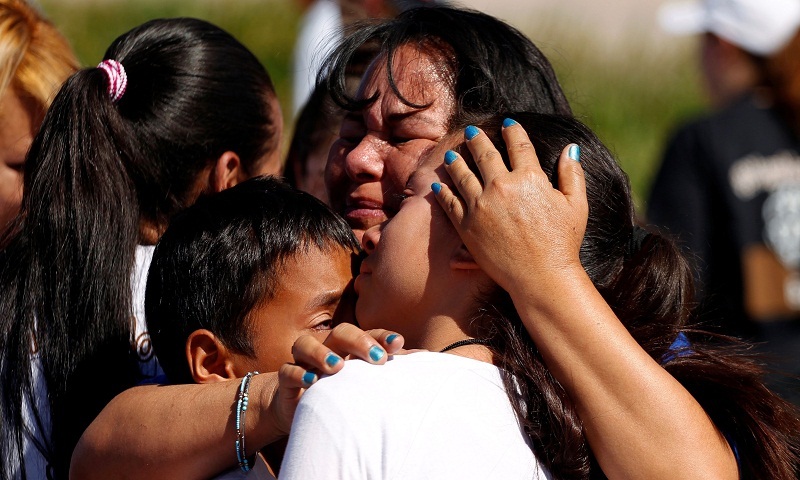 • Parents who were deported could be brought back to the United States to reunite with their children. John Sandweg, who was acting director of ICE from 2013-2014, told CNN this week that he didn't think that was likely. "There's a very good chance they're going to be permanently separated," Sandweg said. But ACLU attorney Lee Gelernt said advocacy organizations are doing what they can to push for more details and bring families back together. "We want all the information from the government that they can provide," he told reporters Friday, "so we can help find those parents."